Trip to a coastal area looking for butterflies and orchids. Images are largely in chronological order. 50+ Small Heath, 6 Small Blue. I saw around 50 of the Small Heath - Coenonympha pamphilus. Due to the heat they were very active and were virtually unapproachable. This one on the daisy will give some idea of size. As I moved from the low grass that the Small Heath prefers, I passed briefly through a conifereous area. Half a dozen or so Stonechats were singing or fluttering up and down on vantage points. There were quite a few Common Twayblades under the trees. 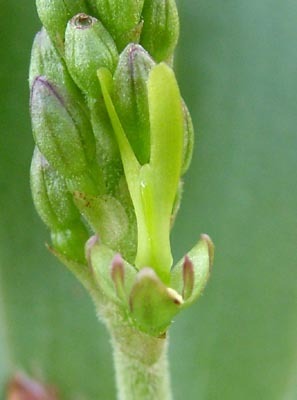 Left hand image shows the budded shoot and the right hand image shows the strangely attractive green flower. This flower is still inverted, and will soon rotate through 180 degrees, like other orchid flowers. This green lichen - Flavoparmelia caperata - was on one of the fallen trunks. Specimen about 15 cm across. The grey specimen to the top of the image is a Parmelia sp. A single flower of the Common Centaury - Centaurium erythraea - was open. 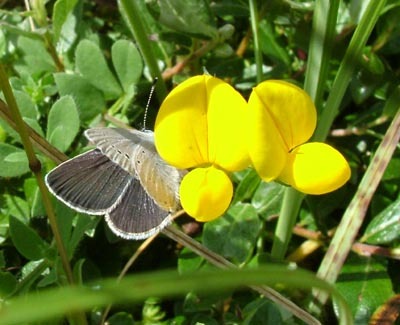 I spotted the Kidney Vetch behind it and began to look for Small Blues, since that is their sole food-plant. 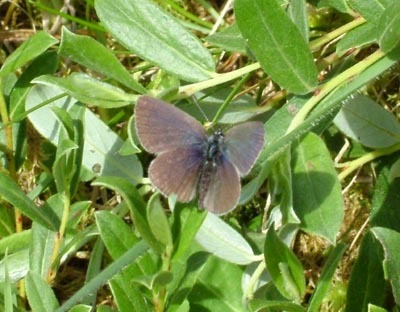 I spotted about half a dozen of these Small Blue - Cupido minimus. They were either basking on grasses or nectaring on the Kidney Vetch - Anthyllis vulnereria. Both images show the male (there are traces of blue). The plant in the second picture is Creeping Willow. So this butterfly is on a tree-top about 10 cm from the ground. This Cinnabar moth was fluttering between patches of grass. Tyria jacobaea. Two more flowering plants to finish. Wild Thyme - Thymus polytrichus - on the left and Selfheal - Prunella vulgaris - on the right.